Note to Readers: This essay has been divided into two posts, both fairly long. The amount of work it took to put these two posts together accounts for the dearth of posts over the last few weeks. Anticipate a return to a more regular posting schedule once the second post has been published. Last fall I wrote a popular series of posts outlining the history of the eight decade war waged between the Chinese Han Dynasty and the Xiongnu (old style: Hsiung-nu) nomadic empire. My posts were a response to a prominent American strategic theorist who misunderstood the history of the Han-Xiongnu relations in his search for enduring patterns in China's military and diplomatic history relevant to China's foreign relations today. Unfortunately, this experience was not a singular event. It seems that every month some new book or article is published pushing a misleading version of Chinese history or a strained interpretation of classical Chinese political thought to shore up a new theory of what makes China tick. I could devote this blog solely to refuting these poorly sourced theories and never run out of things to write about. Despite these errors, I have a great deal of sympathy for those who pen them. They face a nearly insurmountable problem: many of the thinkers, strategists, and conflicts most important to the Chinese strategic tradition have next to nothing in English written about them. Critical works have yet to be translated, translated works have yet to be analyzed, histories of important wars and figures have yet to be written, and what has been written is often scattered in obscure books and journals accessible only to experienced Sinologists. English speakers simply do not have access to the information they need to study the Chinese strategic tradition. This needs to change. It needs to change both for the sake of strategic theory as a discipline, which has essentially ignored the insights and observations gleaned from 3,000 years of study and experience, and for understanding the intentions of our rivals and allies in East Asia, who draw upon this tradition to decide their own political and strategic priorities. But in order to make these necessary changes we need a clear picture of where we are now. This essay attempts to provide this picture. It is not a bibliographic essay per say, for I will freely admit that I have not read all of the books and research articles I will mention below. Some titles I have only read in part; others I have not read at all. However, the goal of this post is not to review the results and conclusions of all these works, but to outline where research has been done and where more research is needed. For this purpose awareness suffices when more intimate knowledge is lacking. Mastering 3,000 years of intellectual and military history is a gargantuan task. But in order to find the answers to some of the questions inherent in the study the Chinese strategic tradition, it must be done. I make no such claim of mastery. My expertise is uneven; I am most familiar with both the strategic thought and the actual events of the China's classical period (Warring States through the Three Kingdoms era, c. 475 BC-280 AD), and am probably weakest when discussing the first two decades of the 20th century, a time critical to the development of the tradition but difficult to master because of the number of political actors involved, the complexity of their relations, and the great intellectual variety of the era. Despite these weaknesses I know enough to chart out the broad outlines of current scholarship, a charge most specialists in strategic theory cannot attempt and most Sinologists would not desire. These biases and proclivities have kept the two disciplines far apart; there is an urgent need for these two scholarly bodies to draw together. If this essay--which is addressed primarily to the first group but should be accessible to second--helps in some small way to bring this to pass I shall consider it a grand success. This essay shall have three parts divided over two posts. The final section is a list of recommendations on how to establish and develop the study of the Chinese strategic tradition as an academic sub-field, as well as some thoughts on where individual Anglophone scholars might focus their research. The two earlier sections will review what has been published in English about the Chinese strategic tradition already. The term "the Chinese strategic tradition" is usually used in reference to the thinkers and the theorists of Chinese history, not the commanders and ministers who actually implemented policy. In the West this is almost always how the topic is discussed. Texts like Sun-tzu's Art of War (hereafter, the Sunzi) are dissected with little reference to the way its thought was consciously implemented by those who studied it most carefully. This is a mistake. Most of the pressing questions in this field can only be answered by looking at how Chinese soldiers and statesmen actually behaved, and most of the errors common to Western punditry can be sourced to this tendency to ignore actual events in favor of theory. In the case of ancient histories--whose account of events were highly stylized and moralizing--this distinction blurs. However, for the sake of organization I shall maintain the distinction between strategic thought (a subset of intellectual history) and strategic practice (a subset of diplomatic, political, and military history), covering each in turn. In previous posts I have described the Chinese strategic tradition as a "great conversation" between disparate voices and viewpoints often locked in bitter debates over basic fundamentals: the nature of power and control, the true sources of national strength, the utility of armed force, the respective merits of offense and defense, the proper aims of an armed campaign, the relative importance of prior planning or strategic thinking to military success, and so forth. While not the first voice to be heard in these debates, the Sunzi Bingfa (Sunzi's Art of War, old style: Sun-tzu Bingfa) was one of the most important and is today by far the best known in the West. Barely a new year goes by without a new translation--perhaps only the Analects, the Yijing (I Ching), and the Dao De Jing (Tao Te Ching) have been translated into English more often. This small book has also seen intensive study in the West, where it is canonical in war studies syllabi and Marine Corp reading lists. It is regularly analyzed in general histories of strategic thought , has been rigorously compared to Western strategic thinkers , and more rarely (but most profitably) has been studied in the context of ancient Chinese thought . Even if we eliminated all of the rather spurious books and articles that have attempted to apply the Sunzi's precepts to business, sports, or social climbing, we would be left with a small library of essays and books chapters applying concepts found in the Sunzi to various tactical, operational, and strategic challenges. It is important to remember through all of this that both in its own day and afterwards the Sunzi was not the only voice in the debate.The strategic principles included therein were hotly contested in ancient China, with many thinkers directly attacking the Sunzi and its precepts. Traditionally, Chinese scholars looking back on the intellectual history of these times described this period of Chinese history as the "hundred schools of thought" (zhuzibaijia), for it was a day when many different philosophical schools flourished (and competed) side by side. However, we must not forget that these hundred schools flourished in an age of conflict and chaos--a period whose regular name is "Warring States." As the name might suggest, the Warring States period (475-221 BC) was an age of vicious and near eternal warfare. During this time any thinker who wanted the attention of those in power had to be able to explain to anxious monarchs how to secure their kingdoms from the threat posed by foreign invasion. This meant that every single Chinese philosophical school had to propose what today we might call a coherent theory of victory, and all thinkers who wanted royal patronage would have to at least touch on war and diplomacy. The good news is that most of these works have been translated into English. Indeed, we live in a golden age of translation and archaeological discovery. Our understanding of pre-imperial China has increased more in the last twenty five years than in the hundred years that preceded them. In the last two decades alone we have seen new translations of the Mozi, Dao De Jing, Analects, Seven Military Classics, Huainanzi, Lushi Spring and Autumn, Sun Bin Art of War, Shizi, Guanzi, Mencius, Xunzi, Yi Zhou Shu and the so called "lost classics" of the Yellow Emperor and the Guodian tomb texts. When combined with the existing translations of the Stratagems of the Warring States, the Book of Lord Shang, Gui Gu Zi, Han Feizi and fragments or excerpts from the works of thinkers like Shen Buhai and Jia Yi (not to mention earlier translations of many of the works mentioned above), there is a considerable corpus of works that touch upon strategic questions available to anyone who speaks English. The downside is that very little has been done to analyze or systematize what these works have to say. The myopic obsession with the Sunzi has hindered those with a background in strategic theory from the rich potential of the rest of the corpus, while the majority of scholars who specialize in these texts focus their research on the ethical, metaphysical, or epistemic claims made inside them. Thus we find ourselves in an odd situation where figures like Xunzi (old style: Hsun-tzu, d. 238 BC)--the most sophisticated thinker of the pre-imperial era--has had dozens of books and essays written about his thought, but none (to my knowledge) devote significant attention to Xunzi's theory of victory, despite the fact he thought the topic of armed conflict enough important to devote an entire treatise to it. That these thinkers have been lost in the shadow of the Sunzi is a tragedy. This is not only because they expanded the debates over war to topics the Sunzi only hints at (such as the relationship between economic and military power, for example, or whether the desires of the people should determine strategic priorities), but also because the strategic approach adopted by the rulers who ended the Warring States era and established China's first great empires closely mirrored (and in some cases were directly inspired by) the thinkers who explicitly criticized the Sunzi and the 'military methods' (bingfa) school of thought. To put matters crudely: the men who conquered and unified the world the Sunzi was written for did so by following methods that were directly opposed to its precepts. Western ignorance of Chinese history and lack of interest in other schools of thought mean that most of us do not have an inkling of what these methods were or if they might be relevant today. An important research question that arises quite naturally from this discussion is how much influence these various schools of thought have in modern China. This question remains unanswered. Edmund Ryen's translation of Yan Xuetong's Ancient Chinese Thought, Modern Chinese Power is a good start on our search, but there remains much to explore. Quantitative analysis provides a promising approach; I would be very interested in seeing the number of times various texts are cited or referred to in open-source PLA publications, or in the speeches of prominent figures like Xi Jinping. Less promising has been the pace of translation of China's classic historical texts. The important texts are the Zuo Commentary, the "four histories" (Sima Qian's Shiji, or Records of the Grand Historian, Ban Gu's Han Shu, or Book of the Han, Fan Ye's Hou Han Shu, or Book of the Later Han, and Chen Shou's San Guo Zhi, or Records of Three Kingdoms) and perhaps Sima Guang's Zizhi Tongjian, or Comprehensive Mirror in the Aid of Government. These histories were not works of strategic theory per say, but they are essential for understanding the later development of the tradition. The role these histories have played in the development of the Chinese strategic tradition can be compared to the role Thucydides' Peloponnesian War played in the development of realist thought in the West--save that passing examinations on Thucydides has never been an official requirement for employment by Western governments, while exams on these books were a mandatory for all members of the Chinese civil service for several centuries. The historical figures and episodes described in the classical histories (especially the Zuo Commentary and Shiji) provided later Chinese thinkers with a common set of reference points through which to debate diplomacy and war. The Chinese have ever been a precedent citing people, and you must work hard to find a memorial, recorded debate, or strategic treatise written in imperial times that does not reference these books profusely. They are simply necessary reference works for understanding Chinese political and military thought. All the sadder that an adequate translation has only been provided for one of them! Sima Qian's masterwork has actually been given two superb translations: the first, penned by Burton Watson in the 1960s, is a literary translation in 3 volumes that includes all of the chapters dealing with Qin (old style: Ch'in, 221-206 BC) and Han (206 BC-220 AD) history; the second, carefully put together by a team led by William Nienhauser, is a heavily annotated scholarly translation that is projected to be nine volumes in total once it has been completed. The other histories have received less favorable treatment. The last complete translation of the Zuo Zhuan was published in 1872; the Han Shu, Hou Han Shu, and Zizhi Tongjian have received only partial translation, some quite old and usually limited to a chapter or two, while the San Guo Zhi has not been translated at all. A new translation of any of these books would be a huge endeavor. The Tongjian clocks in at 20 volumes in modern Chinese, and an English set would be the size of a small library. However, if academia mustered the resources to publish 40 volumes of Al-tarabi's History or the Sanskrit Clay Library's 60 volumes of material, then there is no reason a translation of the classical Chinese histories cannot be organized. This brings us to the development of strategic thought in mid to late imperial China (defined here as 960-1912 AD). Though discourses on war were not as popular with the great Neo-confucian thinkers of late imperial times as they were with their ancient predecessors, history did not stop when Neo-confucianism rose ascendant. China still faced external security threats and the specter of internal rebellion. Literati involved in government--and at this time those who governed were almost all literati--still had to face the harsh questions of strategy. Their writings in response to these challenges could be quite voluminous. Strategic theory in late imperial times was most often expressed in what today we might call 'grand strategic' terms, with a focus on the social and economic basis of state power. These are the aspects of power with which mandarins living far from the frontier were most familiar with, and they were safely within the sphere of the 'civil.' There is a temptation to fault these men for their relative neglect of operational art and campaign strategy, but I do not think this should count too much against them. The treatises and memorials they wrote were quite sophisticated (and seem even more so when compared to what was being written by medieval European contemporaries), and had a lasting impact on the course of Chinese statecraft. The state of English scholarship on these men and their doctrines is opposite of the scholarship on ancient Chinese strategic thought. Here many books and articles dissecting their theories of statecraft and describing their policy proposals have been written, but there is a dearth of translated material. Thus every book on the Song Dynasty (old style: Sung, 960-1279 AD) has a lengthy section on Wang Anshi's (d. 1086) political program, but there is no complete translation of the celebrated series of memorials in which he laid this program out. The same pattern extends right up to studies on the cusp on the modern era. Wei Yuan (d. 1858), perhaps the most seminal strategic theorist of Qing (Ch'ing, 1644-1912) China, has had several books or articles written about him and is a regular feature of general surveys of the dynasty. However, neither his most famous work on statecraft, nor the famous anthology of writings he collected and published, The Collected Essays on Statecraft of the Great Qing (Huang-Qing Jingshi Wenbian), has been translated into English. Short excerpts from Wang Anshi, Wei Yuan, and the many theorists who lived between them can be found in books like Sources of the Chinese Tradition and China's Response to the West: A Documentary Survey, but these are rarely more than a page or two long and are utterly insufficient for serious comparative study. Not all who wrote in late imperial times were establishment bureaucrats and scholars, and I hope the discussion above has not led you to think that the voices of true fighting men were silent during the last millennium of imperial history. Nothing could be further from the truth: military works had never been written at a faster pace than during the final dynasties of imperial China. During the Song Dynasty wood-block printing went mainstream, making it possible to publish and distribute on a large scale without imperial patronage. As a result the number and type of sources that are available to us increased dramatically. There were literally thousands of books on military science published during these centuries. Many of these were tactical manuals, describing how to repel besiegers, use gunpowder in battle, or drill men to move in formation. Others included first hand accounts of individual battles or campaigns, commentaries on existing military methods literature (especially the Seven Military Classics, which were canonized as such in the mid Song), and by the time of the late Ming, sprawling military encyclopedias. The greatest challenge facing researchers here is wading through the vast amount of available material to find the gems within it. From the cursory way these texts are treated in the secondary literature, one gets the impression that they were mostly records of tactical and technological advances. Such material is the bread and butter of the military historian's work, and a rigorous examination of their contents will likely be enough to end the ubiquitous blather about the indirect, "Eastern" way of war. Whether or not there were developments in strategic thought to match the advances in tactics and technology is a question still unanswered. The encyclopedias and treatises of these centuries are largely unexplored in Western scholarship, so it is quite possible that the military writers of the late imperial era were just as perceptive as their ancient and modern counterparts. But--at least for Anglophone scholars and readers--that still waits to be seen. I can think of few other examples where there is such a clear abundance of source material yet such a desert of scholarship. This is an enormous scholarly field, and a potentially career building set of projects for many scholars. As we approach 20th century Chinese history the amount of research published in English increases dramatically. China's contact with modernity was a violent and desperate affair. The structures and ideas upon which Chinese society had been built for centuries were torn to pieces in a few decades. The focus of every Chinese thinker and strategist during the subsequent 'century of humiliation' (bainian guochi) was how to regain China's prestige on the international stage and expel the foreign brutes who leached off of their nation's wealth. Importantly, the humiliation forced upon the Chinese people was a humiliation decided by the force of arms in the midst of battle. China's sovereignty could not be restored without amassing and using the power necessary to drive out the imperialists and vanquish rebellious warlords. This meant that, as was the case in the Warring States Era, any thinker worth his or her salt would ultimately have to articulate how his or her vision for China's future lead to victory on the battlefield. The difficulty scholars of strategic thought face trying to reconstruct the strategic theories of this era is that few writers or statesmen articulated matters in such harsh terms. Attempts to reconstruct the intellectual history of the era rarely take strategy as their focus, and are generally organized around topics like nationalism, democracy, modernization, and so forth. These topics were intimately related to strategy, and so a great deal about the strategic and grand strategic principles current in the era can be found inside these histories, but it is up to the enterprising reader to find these scattered details and piece them all together into one coherent picture. Writing on the war-lords, the civil wars, and the eight year anti-Japanese war tends to fall into one of two types. The first is campaign history, the second attempts to evaluate the military as a political and social phenomenon and its effects on society and the economy. Much of the earlier work tended to fall into the first type, adopting a partisan framework, depending on whether the author was writing in a GMD or CCP context. The tendency to downplay men killed on the battlefield in favor of words used in pamphlets or speeches has (ironically) led intellectual historians to ignore the very ideas that had the greatest impact on the course of the wars: the strategic principles and theories used by the major combatants in their search for victory. This neglect of war and strategy as a central theme leads to disappointing omissions in downstream scholarship. For example, Orville Schell and John Delury devote only a single paragraph to the Northern Expedition in their otherwise excellent discussion of the political program and grand strategic thought of Chiang Kai-shek in their Wealth and Power: China's Long March to the 21st Century. The Northern Expedition was Chiang Kai-shek's greatest accomplishment and the sole reason he was able to accomplish anything else. If there was a connection between Chiang's attitudes toward power or the strategic principles he cherished and his most successful military campaign the reader would never know it. The failure to address strategic thought is a weak thread in many historical narratives surrounding the period. Events like the First Sino-Japanese War, the Boxer Rebellion, or the campaigns of the warlords are often treated as external events that catalyzed intellectual change. That individual military operations or even broader strategies can also be treated as the products of intellectual change--in other words, as the application of ideas on the battlefield--is foreign to most of the intellectual histories and many of the political histories written about the era. The few outliers--here I think of work done by folks like Arthur Waldron or Sarah C.M. Paine--tend to be from scholars with unusually strong backgrounds in strategic studies. The great exception to all of this is of course Mao Zedong. Mao considered himself a great thinker and theoretician, and the political importance of his works in later times would ensure that they received full translations into English. Partly because of this fact, and partly because the model of popular revolution he pioneered inspired communist revolutionaries across the world, Mao's military works have become classics in Western military academies and have been put under intensive scrutiny by scholars of strategic theory. 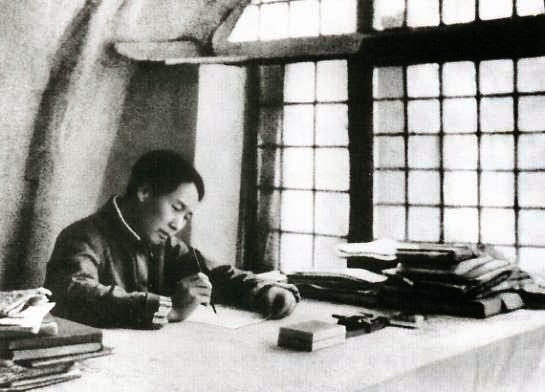 There are studies tracing Mao's intellectual debt to Western strategic thought or contrasting him with major Western thinkers, studies applying his model to contemporary insurgencies, and studies dissecting his actual campaigns to better discern how theory translated into practice. The trend in the present scholarship is to expand the range of analysis past Mao to the other prominent leaders and generals of the CPC's early days. The predictable result of such investigation is that Mao took much of the credit not only for the actions, but also for ideas and strategies, first proposed by his comrades. Inasmuch as it helps us understand the dynamics of popular insurgencies and the development of the Chinese strategic tradition, this is an extremely useful line of research and I am pleased to see its progress. The literature on the development of Chinese strategic thought and doctrine during the next several decades after the death of Mao is similarly thorough, though the study of contemporary Chinese strategy presents some interesting problems. The first I have already touched on above: the extent to which the different strands of the Chinese tradition are acknowledged and used today. Another important question is how the process of strategy creation is understood and implemented at various levels of the PLA, PAP, and CPC. A third topic is whether there have been developments in strategic theory made by Chinese theorists capable of improving our own understanding of strategy, its creation, or its implementation. Part II of this series, which briefly reviews the state of Chinese military and political history and offers recommendations for the future of Chinese strategic theory as a sub-discipline, can be found here. This was, incidentally, Luttwak's primary error; his attention was so arrested by the strategy Lou Jing proposed to defeat the Xiongnu that he did not check to see how it performed when actually implemented. A recent example is found in Lawrence Freedman, Strategy: A History (Oxford: oxford University Press, 2013), 42-54. There are many examples, but the best remains Michael Handel, Masters of War: Classical Strategic Thought, 3rd ed. (New York: Routledge, 2000). I would include among the best of these Derek Yuen, Deciphering Sun Tzu: How to Read The Art of War (Oxford: Oxford University Press, 2014); Victor Mair's recent translation and attached commentary, The Art of War: Sun Zi's Military Methods (Translations from the Asian Classics) (Columbia: Columbia University Press, 2009); Andrew Seth Meyer, "Introduction," in The Dao of the Military: Liu An's Art of War, trans. Andrew Seth Meyer and John S. Major (New York: Columbia University Press, 2012), 4-20. I blogged about (and excerpted heavily from) the last of these articles here. - For example, Xunzi 15.
 Notable exceptions include Thomas Kane, Ancient China on Postmodern War: Enduring Ideas from the Chinese Strategic Tradition (Cass Military Studies) (New York: Routledge, 2014); Hans-Greg Moeller, The Philosophy of the Dao De Jing (New York: Columbia University Press, 2006), 54-87; and Derek Yuen's chapter on the Dao De Jing in Deciphering Sun Tzu, 65-99. Those willing to dig into dissertation territory may also benefit from reading Christopher Rand,"The Role of Military Thought in Early Chinese Intellectual History,"PhD diss, Harvard University, 1977. I wish I could say this was a controversial point in the literature, but it is not, for there is no literature to speak of. Of the small bit of attention the conquests of Qin has received by scholars, the general consensus follows the traditional explanation that their success can be attributed to 'legalist' economic and social regime that welded that empire together. While folks like Steven Sage would like to expand this narrative to include additional factors, no one argues that the Qin's success was primarily or even partially the result of strategic genius or superior operational art. The success of Han Gaozu after the collapse of the short lived Qin empire has received even less attention. I have only found one article that even attempts to address why Han Gaozu was more successful than his enemy Xiang Yu (See Wang Aihe's "Creators of Emperor: The Political Group Behind the Founding of the Han Dynasty," Asia Major 14, no. 1 , 19-51) and have looked in vain for a serious treatment of the Han-Chu contention anywhere. It was widely acknowledged during the war that Han Gaozu was neither as good a warrior nor as brilliant a strategist as his opponent, and Gaozu did not attribute his success to his military methods (bingfa). The most famous theory for his victory was proposed early in the the early first century in an essay by Jia Yi titled, "The Faults of Qin," which not only sought to explain why Gaozu triumphed over Xiang Yu, but why the Qin could conquer the world but not maintain their conquests for more than a decade. It is an excellent example of what I call the "Realist-Confucian" school of strategic thought. What united this Realist Confucian 'school' with the Legalists who took credit for Qin's rise was their utter disdain for those relied on generalship, deception, and operational maneuver for victory. This could win battles but could never win wars--much less conquer the world. More important than strategic skill was the ruler's ability to mobilize and organize resources for war; victory went not to the swift, nor to the smart, nor to those with best shi (勢), but to the kingdoms who could outlast and exhaust their enemy or steal the support of their population and officials. Realist Confucians like Xunzi, Lu Jia, and Jia Yi had very different ideas about how to do this than Legalists like the authors of the Book of Lord Shang or Han Feizi did, but their critique of the bingfa literature was in this respect quite similar. Endymion Wilkinson, Chinese History: A New Manual (Cambridge MA: Harvard University Press, 2012), 636-643, has a useful summary of these works and their subsequent influence on later Chinese thought and politics. For one example, see Mao Zedong, "Problems of Strategy in China's Revolutionary War," ch. V, part 3 (December 1936), published in Selected Military Writings of Mao Tse-tung. On the influence Water Margin had on Mao's thought in general, see Stuart Scrahm, Mao Tse-tung (New York: Pelican Books, 1967), 21, 43-44, 128, 159. 吴怡婷 (Wu Yiting), "浅析《三国演义》中的一类谋臣形象" [Brief Analysis of the Types of Stratagems in Three Kingdoms], Journal of Harbin University 23, no 4 (2002). One notable exception is Peter Moddy, “The Romance of the Three Kingdoms and Popular Chinese Political Thought” The Review of Politics, 37, No. 2 (1975), 175-199. For what it is worth, this essay is the best analysis of the novel I have read in English, and I have read many. I speculate that the difference in focus seen between the scholarship of ancient China and that of mid and late imperial China reflects the dominance of linguists and philologists in the field of early China studies; rarely does their interest in rhetoric or philology extend any closer to the present than the language used by famed poets of the Tang Dynasty. Books and articles on Wei Yuan include: Jane Kate Leonard, Wei Yuan and China's Rediscovery of the Maritime World (Cambridge: Harvard University Press, 1983); Wang Chia-chien, A Chronological Biography of Wei Yuan (Taipei: Academia Sinica, 1967); Peter M. Mitchell, "The Limits of Reformism: Wei Yuan's Reaction to Western Intrusion," Modern Asian Studies 6, no. 2 (1972), 175–204; Philip Kuhn, "The Ideas Behind China's Modern State," Harvard Journal of Asiatic Studies 55, no 2 (1995), 295-337. Kenneth Swope captured the scope of this change when he noted in a recent interview that during the late Ming there were more books in China than could be found on the rest of the Earth. Bob Wintermote, "Ken Swope: The Military Collapse of China's Ming Dynasty, 1618-1644," interview with Kenneth Swope, New Books in Military History, podcast episode (11 February 2015). I base this impression on comments by Ralph Sawyer, "Military Writings," in Military History of China, ed. David Graff and Robin Hingham (Lexington, KY: University Press of Kentucky, 2002) 97-115; Herbert Franke, "Siege and Defense of Towns in Medieval China," in Chinese Ways of Warfare, ed. Frank Keirman and John K. Fairbank (Cambridge: Harvard University Press, 1974), 151-201; Kai Filipiak, ""Saving Lives" - Lu Kun's Manual on City Defense," Journal of Chinese Military History 1, no. 2 (2012), 139-188, esp. 144-147; Endymion Wilkinson, Chinese History: A New Manual (Cambridge: Harvard University Press, 2012), 314-336. Wilikinson, Chinese History: A New Manual, 883. Harold Tanner, "Learning Through Practice: Lin Biao and the Transition to Conventional Combined Operations in China's Northeast, 1946-1948," Journal of Chinese Military History 3, no 2. ( 2014), 4. They write: "When Chiang had taken over the Nationalist Party leadership in 1925, the country seemed to be reaching a new low point each year and no one seemed to know how to top its downward slide. But when in 1926 he launched his new Russian-trained army on the Northern Expedition and, through a combination of military victories, backroom accommodations, and good luck, managed to bring China's patchwork of feudal warlords back into a semblance of national unity, it was a stunning and unexpected triumph." Orville Shell and John Delury, Wealth and Power: China's Long March to the 21st Century (New York: Random House, 2014), 177. Prominent examples include Tanner, "Learning Through Practice"; Christopher Lew, The Third Chinese Revolutionary Civil War, 1945-49: An Analysis of Communist Strategy and Leadership (New York: Routledge, 2009); Wilbur Hsu, "Survival through Adaptation: The Chinese Red Army and the Encirclement Campaigns, 1927-1936," MA Thesis, U.S. Army and General Staff College. 2012; Victor Shiu Chiang Cheng, "Imagining China's Madrid in Manchuria: The Communist Military Strategy at the Onset of the Chinese Civil War, 1945-1946," Modern China 31, 1 (2005), 72-114; and "Modern War on an Ancient Battlefield: The Diffusion of American Military Technology and Ideas in the Chinese Civil War," Modern China 35, 1 (2009), 38-64; William Wei, "Political Power Grows Out of a Barrel of the Gun: Mao and the Red Army," in Military History of China, ed. David Graff and Robin Hingham (Lexington, KY: University Press of Kentucky, 2002), 229-249. Dennis Blasko, "Chinese Strategic Thinking: people's War in the 21st Century," Jamestown Brief 10, iss. 6 (10 March 2010); Joe McReynolds, "China's Evolving Perspectives on Network Warfare: lessons from the Science of Military Strategy," Jamestown Brief 15, iss. 8 (15 April 2015); Dennis Blasko, The Chinese Army Today: Tradition and Transformation for the 21st Century (New York: Routledge, 2012). The best summary of this literature and its findings is probably Taylor Fravel, “China's Search for Assured Retaliation: The Evolution of Chinese Nuclear Strategy and Force Structure,” International Security 35, no 2 (2011), 48-87; For a recent translation of documents related to Chinese nuclear strategy, see Gregory Kulacki, China's Nuclear Strategy (Cambridge, MA: Union of Concerned Scientists, 2015). This is remarkable work. May your tribe increase. Thank you for this article, I'm looking forward to part 2! As a typical westerner who has only read Art of War, I found this to be an excellent primer on the more substantial works that the East has to offer, thank you! Some time back, I became unhappy with most of the writing on South Asia from an American perspective. I decided to look for military attaches and at American military journals. From the beginning, similar language has been used and it has never really changed. Dr. Fair's most recent work are new ideas for Americans but not really for anyone else. At any rate, I always thought this would be interesting to do for the US and China, start with military journals and look at how American narratives have changef, or not changed. Very nice post. Writing by military attaches....a number of memoirs. I am interested in this for the CBI theater and how it relates to today, especially American use of language. American narratives regarding the opening to China also interest me. It is similarly narrow in its essential scholatship, it seems to me, and almost wholly from American sources. Am I wrong about that? This is extremely useful, and very timely. I would be interested in your opinion about Derek Yuen's new book, DECIPHERING SUN TZU. Many thanks for your fine work. I referenced Yuen's book several times in the foot-notes. I think it an admirable effort and in many places quite brilliant. I disagree with some of his conclusions about a "chinese way of war" for the reason I outline in my second post; I also question some of his conclusions about the Dao De Jing, but more in a nit-picky way more than anything else. I recommend the book to anyone. You might be interested in the document Arthur Waldron edited How the Peace was Lost. It is a bit pricey but anything Waldron has worked on is bound to be superb. Apparently it was a memo written by one of the best China experts America had in 1920s, stationed there as a diplomat, chronicling how/why China descended into war with Japan and set up WWII. On the Sinica Podcast a few weeks ago someone recommended another book of this type-- apparently an OSS officers dispatches during the 30s and 40s about what was happening in China, only declassified and published a few years back. I will see if I can find that episode and figure out which book they are talking about. Much appreciated, T. I look forward to reading more of your work! Thank you so much! I'm sorry I haven't been able to respond earlier. That is exactly what I am looking for. I have access to a pretty robust inter libary loan program. Sounds perfect.